The Pontiac Islands Reserve is located in the central northern reaches of Shawanaga Inlet. 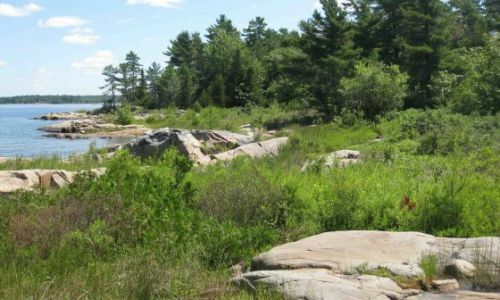 A group of four islands that was gifted to the GBLT by the Pointe au Baril Islanders Association, the property has a high diversity of flora and fauna, extensive and healthy coastal wetlands and an elevated pond during low water cycles. Pontiac’s coastal wetlands and its mosaic of wetland and rock barren are its primary conservation targets because they support two documented species at risk, Eastern Massasauga Rattlesnake and Eastern Foxsnake. It is reasonable to suspect that they also provide habitat for one or more species of turtle.